As I’ve said before, I love seminary. Love the hookah…I’ve got one myself. Cool, but what’s with the paper bag? What’s there to be ashamed of? thus spoke churchpundit! OK. Don’t you have ministers reading this thing? Don’t get me wrong, but singing (love-)songs to the Creator of the whole universe (Who, by the way is completely in love with us…) is kinda weird, while all that this picture suggests is just ‘normal’? Wow, I knew Atlanta was a backward place, but why are you sucking on the hose from a tire pump? Attention all Pastor Nominating Committees: He’s just kidding! Really! what are you gonna do if you end up in a community where there’s loads of people that struggle with alcohol and drug use? Er…why is this a reason you love seminary? Is it the only place you’ve found to smoke and drink? Last I checked, there are plenty of places called ‘clubs’ that allow you to do that without having to pay tuition and write papers and read books. Since hookahs are not very common in the US, most people assume that they are used to smoke illicit substances. Those of us who have had the pleasure of smoking a fruit-flavored molasses-soaked tobacco after a nice dinner can only smile with sweet remembrance at sight of the picture. 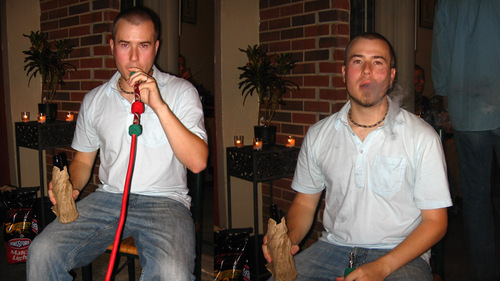 Hookah’s are *very* common here, and if you see a white person using one, and they’re not in an Egyptian/Lebanese/Turkish club or restaurant, you can pretty safely assume that that’s not tobacco they’re smoking. Im at work right now in a banks data center and I just showed that picture to the african american janitor that was cleaning the room. I asked him what he thought of it and he gave the “mmmmmm” of unbeleif. I said to him “he is a Christian” and he said “Hes not a Christian!”. I told him “yeah he is he is a presbytirian”. And his eyes got huge! hahaha Maybe you had to be there? Clearly meant to get a rise. My rebellious stage was in high school, not seminary/grad school. another sad reflection of the dysfunction of the Body of Christ…..skip seminary…please!! And you’re not like the world…how, exactly? Is that stuff you’re smoking illegal? If not, then what is it and why use a hookah? Adam was asked, “why is this a reason you love seminary?”…my answer would be, because seminary need not exclude living. Live on, good sir. I suppose this pertains more to the alcohol collection and use thereof in other pictures, but also in the appearances of evil and partaking in worldly things, especially from a pastor-in-training. I hope you will meditate on these verses because they are straight from the Bible. I have to remind myself of these same verses all the time and I share them out of love that you might consider them as well. >>>…my answer would be, because seminary need not exclude living. Live on, good sir. Smoking and drinking is “living” now. I see. Apparently Adam only smoked and drank in seminary and now his wife doesn’t let him anymore. Otherwise this post makes no sense. You guys just don’t know the Christ of the Bible! Ha…Slice has linked to you. Andrew’s last comment supplies content to the Biblical passages which is not necessarily there. It assumes that those passages can be applied in cases like these. On what grounds? Last time I checked, Adam wasn’t up for bishop. First, we’re not talking about anyone being a drunk here. Second, hopefully Christ’s salvation is not from alcohol and smoke, because that’d be a pretty pathetic salvation (and then theologically you’d need to have Jesus saving himself from his own sinful life). When you come into the conversation already believing something to be wrong, of course one reads those passages as backing it up. Would Adam drink with people in a congregation who are recovering alcoholics? I don’t think so. Can any recovering alcoholic tell you that their issue with alcohol is different than other people’s experience? Yes. This is simply much ado about nothing. I’m done here. I started laughing when I saw the picture, I laughed harder when I read your comments Adam.